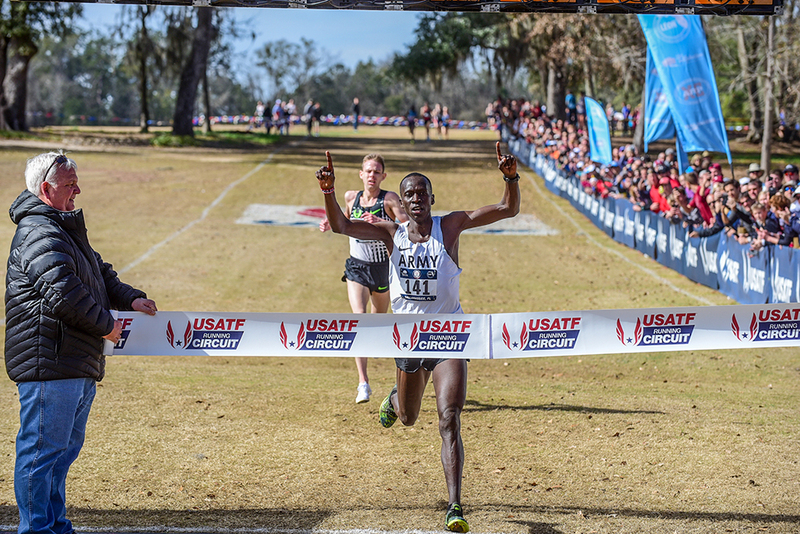 THE BIGGEST EVENT of the weekend might be nowhere near an indoor track, as Tallahassee’s Apalachee Regional Park will host the USATF XC Championships. The races will be choosing Team USA for March’s World Champs. On the men’s side the field is equally daunting: Leonard Korir going for his third straight, Emmanuel Bor, Hillary Bor, Eric Jenkins, Stanley Kebenei, Shadrack Kipchirchir, Ben True, Garrett Heath, Drew Hunter, Dillon Maggard, Chris Derrick and so on. Most of the U.S. team that raced at the last Worlds (Kampala ’17) is back, along with some pretty solid track talent. 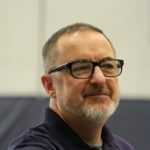 Throw in some names we haven’t seen over hill and dale in recent years (Huddle, Rowbury, Houlihan) and we could see some hot performances on the speedy course. Unlike much of the rest of the country, Tallahassee should see nice weather, with temps in the mid-50s at race time and a 30% chance of rain. A top international field will generate headlines from the IAAF meet in Germany. Young long jump phenomenon Juan Miguel Echevarría will open up his season. Dafne Schippers and Mujinga Kambundji will clash over 60. The vault will feature another tussle between Katie Nageotte and Katerína Stefanídi, who have split their two previous meetings this year. The 44th annual in Lincoln is bringing together some top collegiate talent, including squads from Georgia, Illinois, Iowa, Iowa State, Kansas State, Missouri and Stanford, in addition to the hosts. Husker frosh George Kusche, who ran 3:58.96 in South Africa last winter, will attempt to be the first Husker to break 4:00 on a 200 track. Georgia’s double NCAA champ Denzel Comenentia will highlight the throws and Lynna Irby will run the 200. With bonuses offered for flat-track world records, organizers have attracted some strong fields. The women’s 800 will feature Ajee’ Wilson and Raevyn Rogers, along with prep phenom Athing Mu. The men’s 800 will bring us Clayton Murphy and Drew Piazza. The mile will feature a battle between Edward Cheserek and Nick Willis. Arkansas, Houston, Texas and TCU are among the schools that will battle with host A&M. Cameron Burrell will run the 60. Bralon Taplin is set to run the 300. Michigan will host Wisconsin, Louisville, Minnesota & Indiana, among others. Expect to see a solid 800 with comebacking NCAA 1500 champ Jamie Phelan of Canada taking on Shannon Osika and new Wolverine find Aurora Rynda (1:29.55 for 600 two weeks ago). Sharon Lokedi of Kansas will headline a solid field in the mile, while Louisville’s Dorcas Wasike should lead the 3000. Florida will be among the schools attending. 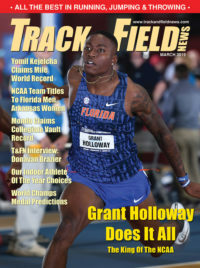 Will we see more surprises from Grant Holloway, fresh off a 60 PR of 6.51 last weekend? Or will he take a rest from what has already been a busy season?